The referendum in Scotland is shaping up to be a nail-biter. Scotland will, quite rightly, get whatever the majority of Scots want. While the margin will be tighter than many expected, writes Sunder Katwala, that still looks like a vote to stay in the United Kingdom. The Scottish referendum campaign has turned into a knife-edge race. The poll of polls has shrunk to a 55-45 margin, and the most recent YouGov poll had the gap at 53-47. Social media is awash with unverified rumours that an unpublished Panelbase poll is about to show the first-ever Yes lead. The Yes campaign is certainly excited and believes it has the momentum to carry it to victory. The No side, has long talked about the need not to be complacent, and many within it are now genuinely nervous, perhaps for the first time. Yet there are several reasons to think that, despite the intense political drama, the No camp will prevail, though by a narrower margin than was widely anticipated. The result will be closer than most expected – because, paradoxically, the Yes side has had by far the stronger campaign, even while losing the central campaign arguments. That is not my subjective judgement – it is what most Scots themselves appear to think. There is strong evidence for this curious pattern in the Scottish Social Attitudes survey, which offers the most in-depth tracking of how views about independence have shifted, or not, over the long campaign. The Scottish Social Attitudes 2014 evidence shows that Scots do think independence would boost the country’s national pride (+41) – but that, on balance, more Scots think it would be bad for the economy (-19); for personal finances (-29); for the ability to protect bank deposits (-39); for Scotland’s voice in the world (-5); and for the gap between rich and poor in Scotland (-13). Views on each one of these fronts have got at least mildly more negative across the last two years – and significantly more so in the case of the economy. The Yes side began with a long-standing structural 40-60 disadvantage on both the idea of independence and its consequences. It appears to be outperforming that benchmark with the energy of its campaign, without shifting Scotland’s underlying views on the choices on offer. There is little in the most recent polls to suggest the underlying attitudes have shifted significantly in the final weeks. What explains the paradox? The data suggests that the sizeable minorities who had long thought independence could have good economic or social consequences have now become much more solidly Yes, when many of them began, before the campaign, as fence-sitters or mild sceptics about actually going for it. This success in mobilising softer potential support has made a Yes score in the mid to high 40s pretty likely but it remains very difficult to see where the votes would come from to take the campaign over the 50% hurdle. That final 5% would need to come from groups of voters who appear to be negative, sceptical or highly uncertain about what independence would mean. In the 2 September YouGov poll, showing the narrowest Yes-No gap to date, Scots still believed that the economy would be worse off after independence by 44% to 35% and that they personally would be worse off by a two-to-one margin (41% to 21%). The Scottish Social Attitudes survey shows that Scots thought the economic case for and against independence was evenly balanced in 2012 – but that they had become more pessimistic by 2014. “Its Scotland’s pound” has been the most unlikely nationalist slogan of 2014. Alex Salmond’s case for a Currency Union is that the English and Scottish economies are remarkably well integrated, and the two countries would have the goodwill to work together. A currency union after a Yes vote, however, seems highly unlikely. English and Welsh opinion is highly sceptical – despite Alex Salmond’s claim that it is self-evidently in their interests. Salmond’s language, in saying that a Yes vote would give him a “mandate” (from Scotland) to negotiate a currency union, underlines why a referendum in the rest of the UK on this issue would be unavoidable. Those in favour of independence believe something will be sorted out on the currency. The Yes side is trying hard to use a ‘pound in your pocket’ argument that tries to skate over the differences between short-term sterlingisation (prior to a Scottish currency or Euro application) and a currency union treaty that Scotland can’t achieve unilaterally. The referendum debate has been far too much a ‘head versus heart’ choice. That the No campaign has been ‘all head and no heart’ has been its central shortcoming, captured well by Hugo Rifkind in the Times (£) this week. That is partly because No campaign strategists knew that there would be a Yes landslide if this was a referendum about whether Scots felt more Scottish or more British. 65% would choose Scottish and 23% British – if forced to choose – yet even that has narrowed from 75% to 15% three years ago. Yet that misses the central point: most Scots do not want to choose between those identities. After two years of campaigning, even despite the lack of a positive appeal to a shared identity, the Scots’ sense of Britishness has gradually grown considerably stronger. One in three Scots said they were ‘Scottish not British’ in 2011, a proportion that has shrunk to one in four in 2014. ‘More Scottish than British’ has long been the most popular answer, yet it too has fallen to one in four, being overtaken this year by the 32% of Scots who now declare themselves ‘equally both’, the highest proportion for twenty years. That the No campaign has never found its voice, song or an emotional appeal has left it relying on the rather shaky ground that reason alone can trump political passion. The poetry of Danny Boyle’s Olympic opening ceremony got lost in the dour sceptical prose of a campaign that has been much more “No Thanks” than “Better Together”. Even so, a striking feature of the campaign has been how both sides have converged on the territory of shared and popular British institutions. The SNP argues for keeping the Monarchy. Two-thirds of Scots want to keep the pound – so are arguing intensely about whether they would be able too. Most value the BBC – and the Yes campaign’s final push is to leave Britain to keep the NHS: to preserve the jewel in the crown of the post-war settlement. ‘We must leave Britain to keep Danny Boyle’s flame alive’ is the message of an anti-Coalition, anti-Tory, anti-Thatcherite pitch. 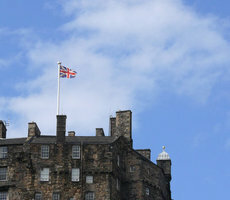 The Yes campaign insists Scotland will still be British after independence, in that the historic and family ties will remain, but these identity views are strongly associated with how people intend to vote. Just one in ten of those who are ‘equally both’ will choose independence, while 60% of those who feel ‘Scottish not British’ will do so. Scots were more likely than the English to say that they were ‘very proud’ to be British in 2014. This rising salience of British identity reflects the general sense that a weakening of the Britishness of Scotland, over the next five, ten and twenty years, would be an obvious consequence of voting to choose to leave the UK. There is still a significant gender gap on the question of independence – as there has been in every campaign poll. There is a range of theories about why this is. It could be about something as specific as Alex Salmond’s personality. It could reflect more interest in the pocketbook issues than the identity issues. There is solid comparative evidence that women voters tend to be more risk averse about untested political propositions, such as outsider parties. What Rachel Ormston’s research sets out is that Scottish women tend to think that there is considerably more uncertainty about the consequences of independence than Scottish men, who are much more likely to be sure about whether they think it will be a triumph or disaster. ‘If you’re not sure, seize the chance and go for it,’ is likely to prove a weaker driver than ‘if you don’t know, don’t risk it’. It will difficult for a Yes campaign, focused on mobilising its support, to reassure enough of the sceptical women voters, whom it has struggled to persuade so far, to narrow that gender gap enough to win. So could it happen? Yes, it could happen. It is no longer a 7 to 1 chance but a 3 to 1 chance. We have all seen shock football results more unlikely than that. There are two ‘late surge’ models which the Yes side hopes to emulate. One is the surprise SNP landslide of 2011, turning a neck and neck race into an overall majority in a PR election. It was an impressive surge, but it was still a surge to 45% of the vote, and around a fifth of those SNP 2011 voters intend to vote No in the referendum. They preferred Alex Salmond over Scottish Labour to run the devolved government, without necessarily wanting independence. The Quebec independence referendum of 1995 offers the other example of a late surge, but with a twist in the tail. The Yes campaign trailed throughout the campaign, but took the lead with a fortnight to go. Yet its six-point poll lead on election day translated into defeat for independence by the narrowest of margins in the vote itself. Referendums do tend to have a status quo bias – and Scottish views today about the risks and uncertainties of a Yes vote capture why that is often the case. That means that for Yes to have a strong, but nervous, chance of victory, it would want to go into election day with a lead of a least three to five points, rather than a small deficit still to make up. This creates a final campaign paradox of the final furlong. For there to be a Yes vote for independence, Scots will need to go to the ballot box with independence having moved from a long-shot, to a possibility, to having become the significantly more likely outcome. That would electrify the campaign still further, exciting those who are already Yes to new heights of ecstasy, yet also bringing a new intensity of scrutiny to the scale of the choice being made. For all its merits as an exercise in democratic engagement, its seems unlikely – in the essential scenario where Scots go to the ballot box believing that a Yes vote is as likely, or even more likely, than a No – that the Yes campaign has done enough to persuade a majority of Scots to take the leap for independence. The case for independence looks, at best, “not proven” in the end. Scotland will get what a majority of Scots choose. The vote itself is a proof that Scots hold popular sovereignty – and that the United Kingdom is a Union of consent. It may prove a nail-biter. But the most unpredictable factor is probably still less the outcome of the vote but just how close the margin of victory and defeat might be. Interesting article. I think you’re right that the polls and figures (so far) favour a “No” victory but I think you’re wrong in a few of your conclusions. First, I’ve met a surprising number of “Yes” voters who don’t think independence will lead to a land of milk and honey. A common piece of “No” scoffing is that “Yes” voters expect independence to “solve all Scotland’s problems”. This is basically untrue, I’ve met “Yes” voters, for example, who think that markets will panic and the economy will slump for a few years following a “Yes” vote because, hey, businesses and the markets are risk averse. They simply see this as the price of getting rid of Westminster and don’t see it as permanent as certainty returns once an independent Scotland goes from “going to happen” to “happened” to “has been the case for a few years” and the element of uncertainty dissipates. Secondly: “Scotland will get what a majority of Scots choose. The vote itself is a proof that Scots hold popular sovereignty – and that the United Kingdom is a Union of consent.” I think that’s a bit of a misunderstanding of the situation up here. Whilst the “No” campaign has been (rightly) criticised, it’s also understood that the most powerful argument against independence has been to focus on uncertainty and to, basically, play to peoples’ insecurities. There will be a fair few people voting “No” not because they don’t want Scotland to govern itself (in fact polls suggest that whlst the Scots are against “independence” they are for “Scottish self-government”) but because they’re worried about their pension, mortgage or whatever. It’s simply wrong to claim that voting along those lines implies someone is happy with the status quo and the Union. It’s like saying someone trapped in a loveless marriage who refuses to leave the marital home because they’re worried about being able to support themselves is therefore “happy in their strong marriage”. IT’s also interesting that some polls suggest “Yes” is *ahead* amongst 16-55 year olds whilst “No” is strongest amongst the (large) 55+ age group. If true, that suggests that the people who will likely keep Scotland in the UK are mostly pensioners or those close to retriement age. That not only would re-enforce the notion that a “No” vote is one of insecurity, but it also suggests that those who are Scotland’s future (economic and social) are less keen on the Union. Another thing which I don’t think is mentioned enough (not least because “yes” wouldn’t like the comparison) is that much of Scotland’s relationship with the rUK is comparable with the rUK’s with the European Union. That is also a situation where businesses and journalists seem dumfounded that England seems to be moving towards a withdrawal “against its economic interests”. Both are arguably motivated by similar factors (a perceived democratic deficit, a suspicion of distant politicians, an anti-establishment wave begun by the 2008 banking crisis and strengthened by things like the Savile scandal) and both appear to have taken a largely complacent Westminster establishment by surprise. There are obvious differences (there is very little of the rightwing populism in the “Yes” camp that has blighted the “EU debate” in England) but the general character of the movements and what motivates them seems similar. Scotland remains in EU, gets EUR. Wales and Cornwall will split as well. England will build some sort of alliance with Pakistan, India and other distinguished countries. We have already seem the results in Rotherham. In exchange English people will join the line with Africans and Asians at European border control – and most important: 80 % of financial institutions in the City will move to Dublin, Paris and Frankfurt or even Warsaw. Furthermore England will leave NATO after loosing nuclear weapons. Everythings goes as empress Merkel predicted … The future is bright for Germany and its allies Ireland, France and Poland. Oh well, I guess writing all this makes you feel better than sticking your fingers in your lugs and humming ‘lalalalalalalala’ but the effect is just the same.